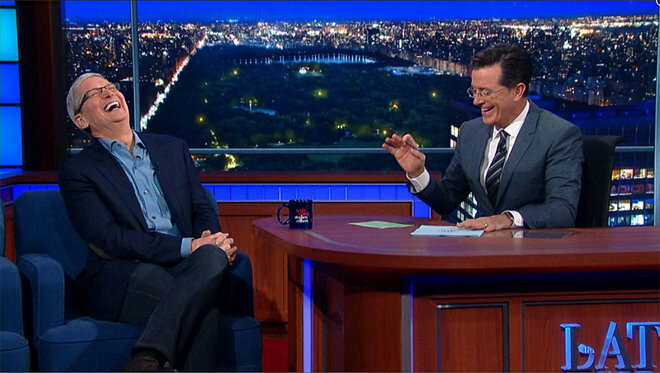 Apple CEO Tim Cook made a rare talkshow appearance Tuesday night as one of the first guests on "The Late Show with Stephen Colbert," taking time to promote iPhone 6s and discuss Apple's core ethics, corporate charity, Steve Jobs and more. Colbert, toting a rose gold iPhone 6s, kept the interview brief as Cook ran him through a few iPhone 6s talking points like 3D Touch, Live Photos and Siri. As can be expected of a late night show, Colbert mostly kept things lighthearted. Considering guests usually vet topics beforehand, Cook faced two "tough" questions, one about his decision to come out last October and another regarding workers rights as it applies to Apple's supply chain partners. "You came out as gay recently. Was that an upgrade or just a feature that had not been turned on?" Colbert asked. Cook intimated that it was his social responsibility to fight back against discrimination, even if that meant putting aside a highly valued private life. "It's like discovering something on your iPhone it's always done but you didn't quite know it," Cook added. On corporate ethics Cook toed the company line, saying Apple focuses on education, the environment and human rights. As it applies to workers rights, long a topic of debate with human rights activists, Cook noted that Apple goes so far as to make college classes available to supply chain manufacturers, a program that helps employees grow and advance their careers. Colbert tried to pry out details on Apple's supposed driverless car ambitions, noting previous guest Uber CEO Travis Kalanick mentioned the iPhone maker was looking into such technology. Cook unsurprisingly demurred, saying Apple investigates tech in a number of areas, but only concentrates on a few. Cook spoke briefly about late Apple cofounder Steve Jobs, who was a "joy to work with" and always demanded the best out of his employees. Colbert awkwardly cut Cook off when he was on the verge of expressing cynicism over the bevy of books and movies released since Jobs died. "I miss him everyday," Cook said. "I think that a lot of people are trying to be opportunistic and I hate this, it's not a great part of our world." In its first week under Colbert, "The Late Show" has invited a number of tech industry heavyweights onto the stage, including Tesla and Space X CEO Elon Musk and the aforementioned Kalanick. For a format tailored to Hollywood celebrities, musicians and comedians, the move is an unusual, but refreshing, change of pace. For Cook, the public appearance is the first of two for September, the next being Box's annual Boxworks cloud storage conference on Sept. 28. Cook is also slated to attend The Wall Street Journal's WSJ.D Live conference in October.